Valentine's Day is no assurance that love is in the air. Hearts and flowers aren't guaranteed to come your way. You may or may not get one of the billion valentine cards that are sent each year. But heart shapes are everywhere and anyone can admire them. Here is a cosmic selection for everyone. Let's start on Earth with a fanciful astronomer looking at the sky in one of the best observing sites in the world. 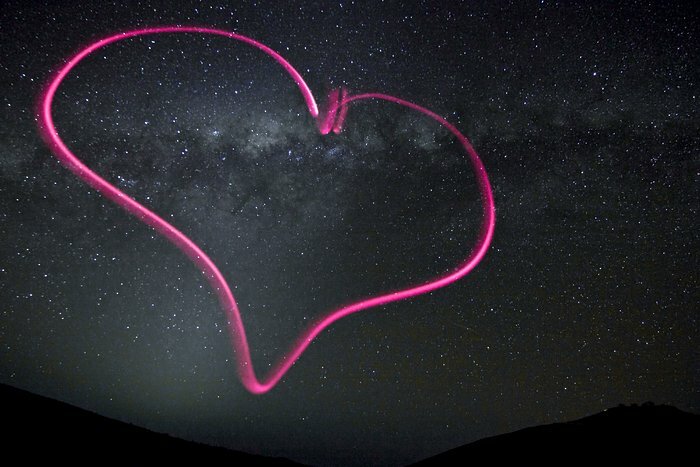 Julien Girard used a flashlight to add a heart to his photograph at the Paranal Observatory in northern Chile. It's the location of the VLT telescopes. VLT stands for Very Large Telescope. (Astronomers aren't always fanciful.) 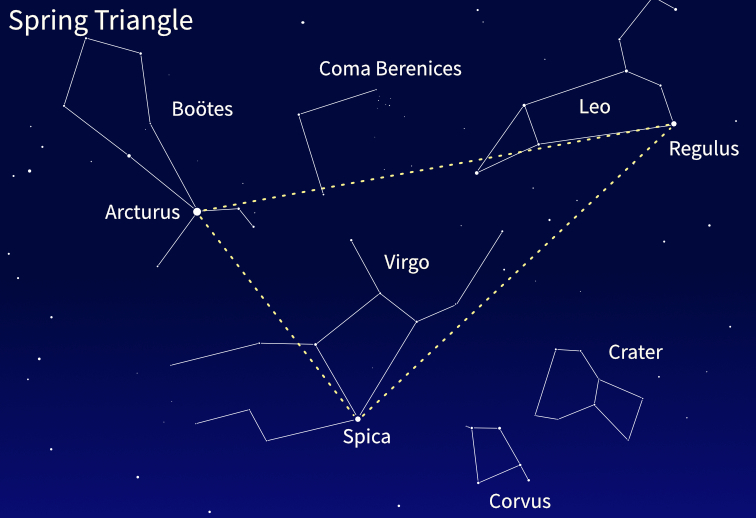 It's composed of four telescopes that can be used separately or in any combination to combine and strengthen the signal. The location is high in the Andes in the Atacama desert, one of the driest places on Earth. The observatory at Cerro Paranal is at 2,635 m (8,645 ft) above sea level. And the observing is fantastic. The Milky Way is overhead in the picture, and parts of it look like puffs of smoke because there are so many stars visible. 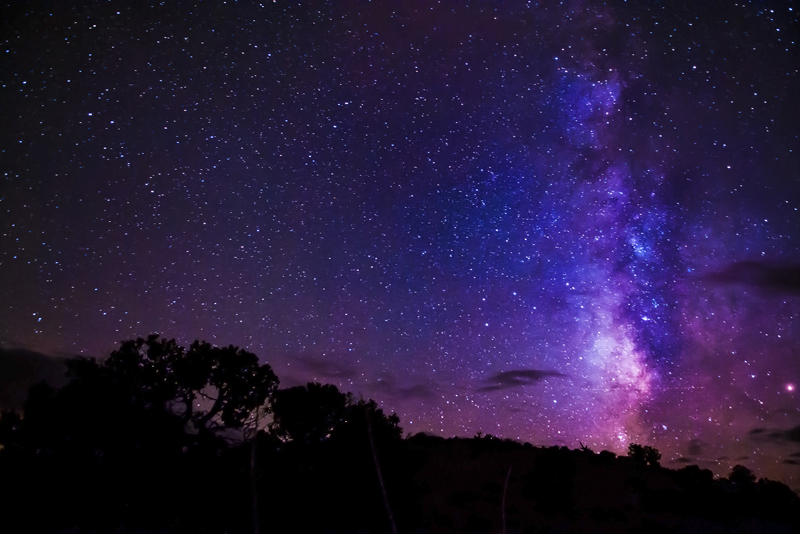 Most people can't see the Milky Way anymore because of light pollution. At Cerro Paranal the Milky Way is bright enough to cast shadows on a clear moonless night. NASA has Valentines for geeks. Here's one using a Mars Global Surveyor photo of a heart-shaped Martian crater. And it includes a little poem: “Mars is red, Neptune is blue, I saw this crater, And thought of you!” Awww. ESA's Rosetta spacecraft was launched in 2004, and ten years later rendezvoused in deep space with Comet 67P/Churyumov-Gerasimenko. In orbit around the comet, Rosetta spent two years studying it as it moved closer to the Sun, rounded the Sun, and headed back out into the Solar System. 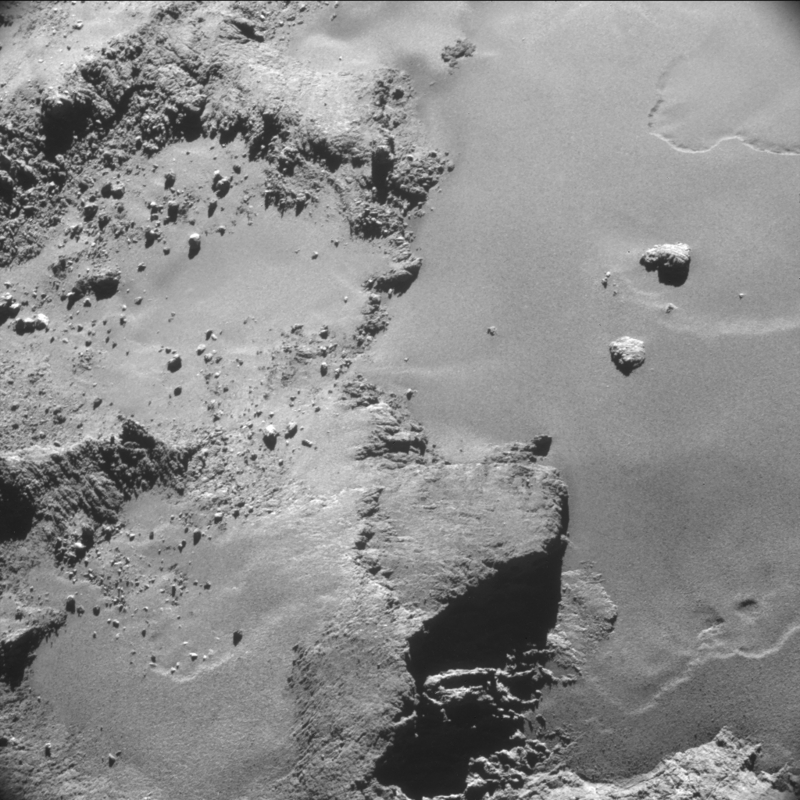 The little lander Philae bounced upon landing and no one knew where he ended up, except that it wasn't in sunlight. Data was transmitted until the battery ran down and couldn't be recharged. The mission ended with Rosetta making a controlled descent onto the comet – happily, Philae was located not long before that happened. The New Horizons mission provided us with a wonderful image of Pluto with a big heart. 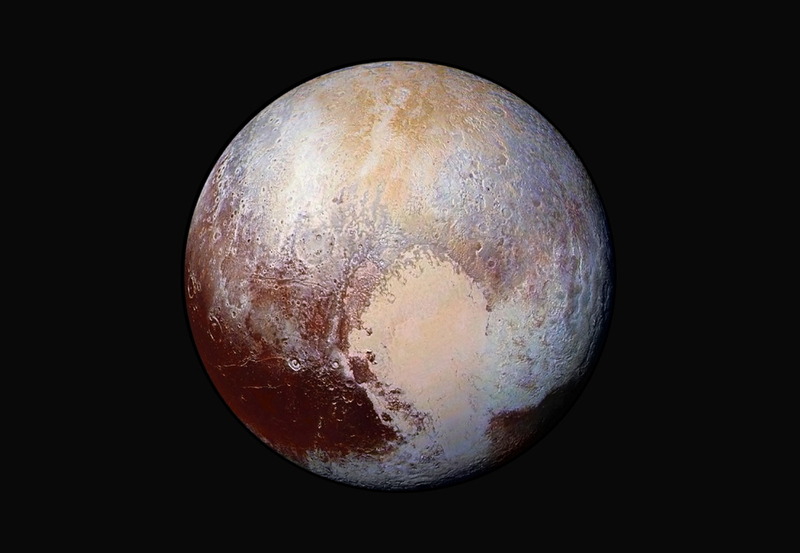 The heart is a large light-colored feature on Pluto, and it has been informally named Tombaugh Regio after Pluto's discoverer Clyde Tombaugh. It was a bright area in images of Pluto taken long before New Horizons, but impossible to say any more about it then. 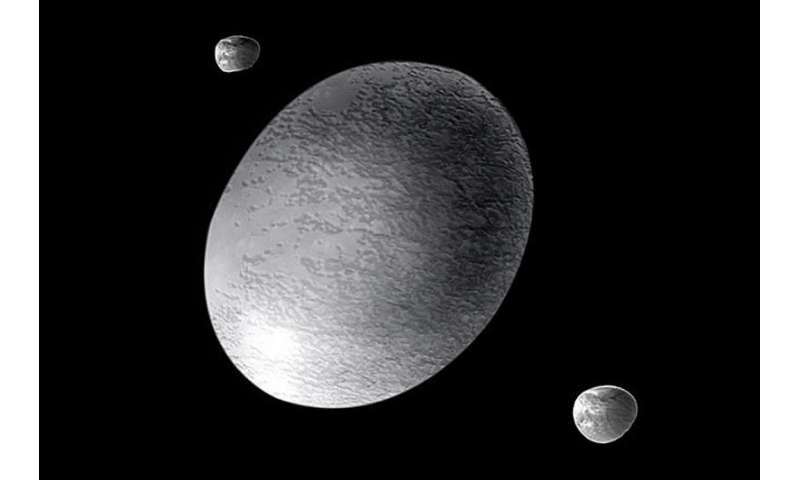 Tombaugh Regio is about 1600 km (990 mi) across. Although they're both light in color, the lobes of “the heart” are two different features. They aren't the same color and the terrain is different. Sputnik Planitia, the western lobe, is a smooth icy plain. It doesn't appear to have impact craters, which means the region has been recently resurfaced by geological activity. The eastern lobe isn't so smooth and seems to be uplands covered in highly reflective nitrogen ice. Our final valentine is a heart on a grand scale. 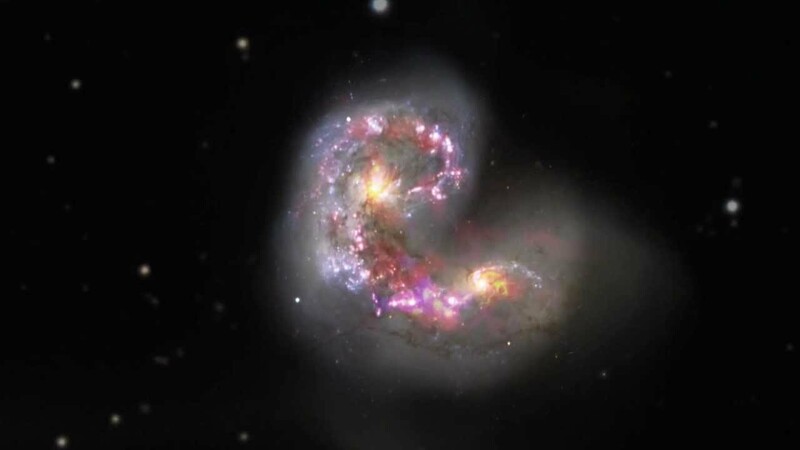 About 900 million years ago two spiral galaxies around 45 million light years away started moving towards each other. They are called the Antennae Galaxies, and located in the constellation Corvus (the Crow). They're still merging and what we see is a beautiful heart shape. Gas and dust were thrown out as the collision proceeded, and there followed a burst of star formation that created billions of new stars. In another 400 million years or so the merger will be complete and there will be just one galaxy, an elliptical one, but no heart.